The advantage of using Drum Patterns instead of a Note Series is that you can more predictably control the sequence and timing of note pitches in a graphical manner similar to a Drum Pattern creation grid in a sequencer. In fact, you can import short MIDI phrases that you created in a sequencer into the Drum group to easily create new Drum Patterns. The disadvantage of using Drum Patterns instead of a Note Series is that the resulting phrase played by the GE is much more repetitive and predictable, and sounds more like pre-recorded material similar to what you hear in an arranger keyboard. Although the Drum group is primarily designed for use with drum programs to create drum/percussion grooves, you can use the Drum group to play melodic programs too. So for example if you're looking to generate a very specific bass line or left-hand piano comping pattern, setting up the GE to use the Drum group instead of the Note Series group might be just what you need. Note: the images in this article are from one of the KARMA Software applications. The three Drum Patterns are normally overlapped so that they play at the same time and merge their respective set of eight possible notes together in the same step (so up to 24 notes could be played together in a single step). However, by selecting the link control shown between each pattern grid, you can cause one or more of the patterns to play sequentially, one after the other. For example, if you click both of the link controls, the eight notes in Pattern 1 will play first, followed by the eight notes in Pattern 2, followed by the eight notes in Pattern 3. 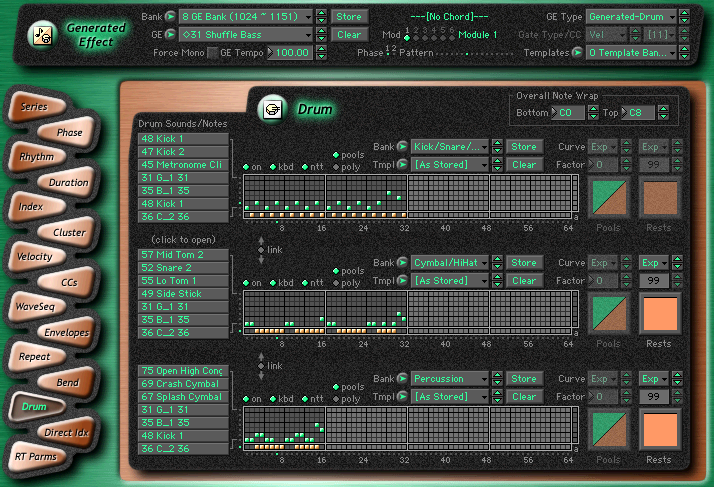 The on control above each pattern grid determines whether the Drum Pattern is enabled for use in the GE or not. Note that the Pattern On/Off buttons in the Master RTC layer for most Generated-Drum GEs don't actually turn the pattern on or off. Instead, they turn the volume of the notes generated by each pattern to be inaudible or audible, via a "velocity offset". For example, in the following screenshot, look at the areas highlighted in a red color. Notice how switches 2, 3, and 4 are set to toggle the "velocity offset" for each Drum Pattern between values of -127 and 0? When the offset is -127, the velocity of each note in the Drum Pattern is effectively -127 (and therefore silent) regardless of its actually velocity set by the Velocity Pattern over in the Velocity group. When the offset is 0, the velocity of each note in the Drum Pattern is whatever value is set over in the Velocity Pattern, so you will hear the notes in that pattern. The randomization of any Random Pools that might exist in all of the other GE parameter groups (Rhythm, Index, Cluster, Velocity, Duration, etc.) all work to make the Drum Pattern sound varied and random each time through a phase just like these pools work to randomize the sound of a GE that uses a Note Series. Rests for each Drum Pattern — if any rests are selected in the same column as one of the 8 possble notes, then the Rests randomization curve comes into play, and it is applied regardless of how the Pools/Poly control is set. In essence, this randomization curve decides whether the rest is "played" or one (or more) of the notes in the column is played, but this gets a bit tricky depending on whether the pattern is using Pools or Poly mode. You should read the KARMA Software help on this subject and do some experimentation to see how the Rests randomization curve works/sounds in each case. The general behavior of the Poolsand Rests parameters and graphs is described in the next section below. 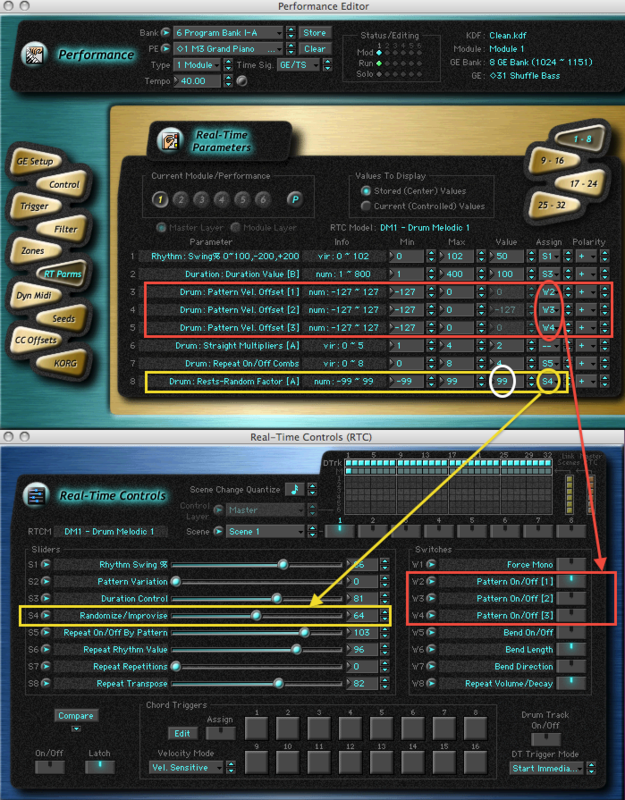 However, the following screenshot shows that the randomization curves for the Index Pattern and the Cluster Pattern are also hooked up to slider 4 in the Master RTC layer, so that one slider will simultaneously change the randomization for the Drum Pattern rests, the size of the index jumps through the Drum Patterns, and the size of the index clusters played in the Drum Patterns (more on how the Cluster Pattern interacts with the Drum Patterns coming soon below). Also remember that the Value setting shows the value applied to the parameter when the slider is in the center of its total range, so in the center position for this particular GE, the Drum Pattern rests are always being chosen over the other notes in the same column (because the value is a positive 99), but the Index and Cluster values are always selecting the lowest values in their respective columns (because the value is a negative 99). Selecting more than one of the 8 possible notes in the same column of a Drum Pattern creates a Random Pool at that step of the pattern. When a step containing a Random Pool occurs, one of the values from the pool is chosen at random, based on the effects of the Weighting Curve and Weighting Factor parameters. Slanting the curve towards the top (a positive Factor that shows more orange color than green color in the graph) results in the higher values from the pool (the values closer to the top of the pattern grid) being chosen more often. Slanting the curve towards the bottom (a negative Factor that shows more green color than orange color) results in the lower values from the pool (the ones closer to the bottom of the grid) being chosen more often. Several different curves are provided to influence the choices in different ways. Setting the curve in the center (a Factor of 0) produces a straight diagonal line and an equal chance of any of the values from the pool being chosen. A Factor of 99 results in a solid orange color, which means the highest value in the pool is always chosen. For S-shaped curves, either the highest or lowest value in the pool is chosen (50-50 chance of either). A simple way to remember the meaning of the color codes in the visual graph is that orange is a "warm" color and green is a "cool" color, and warm air always sits above cold air. Therefore more orange always means higher pool values are favored, while more green means lower pool values are favored. If pools is selected, first the specific note from the pool is selected according to the Pools curve described above. Then the Rests curve decides whether to actually play that chosen note or to play the rest instead. Note that if the Factor of the Rests curve is positive 99 (a solid orange square), this means the rest will always be chosen. If poly is selected, the Rests curve is applied to every note in the column one at a time to determine whether to actually play that chosen note or to play the rest instead. Effectively, then you might end up hearing only one note from the entire pool, two notes, three notes, all notes, or no notes at all depending on how many rests were chosen. one of the values from the pool is chosen at random, based on the effects of the Weighting Curve and Weighting Factor parameters. Note that if the Factor of the Rests curve is positive 99 (a solid orange square), this means the rest will always be chosen in place of each note, and therefore none of the notes in that column will be played. As for the shape of the curve in the Rests graph, the same general pattern as used for the Pools graph applies to the Weighting Curve and Weighting Factor of the Rests Graph too. In the bottom half of the pattern grid for the Phase group there are entire sets of rows that work only with Drum Patterns. The Cluster Pattern from the Cluster group. If this cell in the grid is selected, the entire Cluster Pattern will be used to modify how many indexes are played at each Rhythm Step of the Phase. If this cell is not selected, then only the value(s) — the cluster "Size" — in the very first column of the Cluster Pattern will be used for each Rhythm Step. The Index Pattern from the Index group. If this cell in the grid is selected, the entire Index Pattern will be used to determine how the index jumps through the columns of the Drum Pattern (which columns are played) at each Rhythm Step of the Phase. If this cell is not selected, then only the value(s) in the very first column of the Index Pattern will be used for each Rhythm Step. The Rhythm Pattern in the Rhythm group, the Index Pattern in the Index group, and the Cluster Pattern in the Cluster group always work with each other to determine exactly which note pitches from the three Drum Patterns to play at every step of a Phase. More exact description: The Rhythm group determines the note value of each step in the Index Pattern defined in the Index group. The Cluster group determines how many notes to play in each column of the Drum Pattern grids that the Index Pattern lands on. If the Rhythm Pattern consists of a single line of all 16th notes, and the Index Pattern is a single row of +2 values, and the Rhythm Multiplier value for the Drum Pattern is 100%, then at each Rhythm Step in the Phase (every 16th note), the index of the Drum Pattern will advance by two columns. So effectively every column in this case is a 32nd note, but more importantly, only the columns that are landed upon by each index step will be sounded! If the Rhythm Pattern consists of a single line of all 16th notes, and the Index Pattern is a single line of +1 values, and the Rhythm Multiplier value for the Drum Pattern is 100%, then at each Rhythm Step in the Phase (every 16th note), the index of the Drum Pattern will advance by one column. So effectively every column in this case is a 16th note. If the Rhythm Pattern comprises eight 16th notes followed by four 8th notes (which totals one full measure at 4/4 time), and the Index Pattern is a single line of +1 values, and the Rhythm Multiplier value for the Drum Pattern is 100%, then at each Rhythm Step in the Phase, the index of the Drum Pattern will advance by one column. 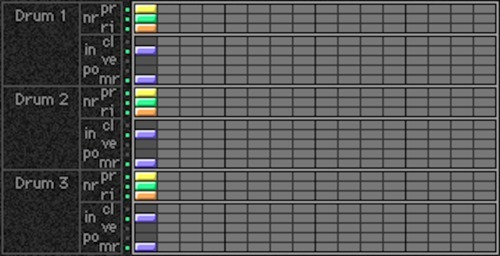 In this case, however, the first eight columns in the Drum Pattern grid are each 16th notes and the next four columns in the grid are each 8th notes. If the length of the Phase in this example was set to be a 4/4 time signature and the Drum Pattern was defined in the phase to restart its pattern at the start of each Phase, then the Drum Pattern would play through only the first 12 columns of each pattern's grid (eight 16th notes followed by four 8th notes) and then restart at the first column again in the next Phase.